Maries calling me, Simon, quick, I think Im looking at otters. As I arrive on the deck, the sleek creatures are climbing from the ocean. I can see four, no perhaps five. 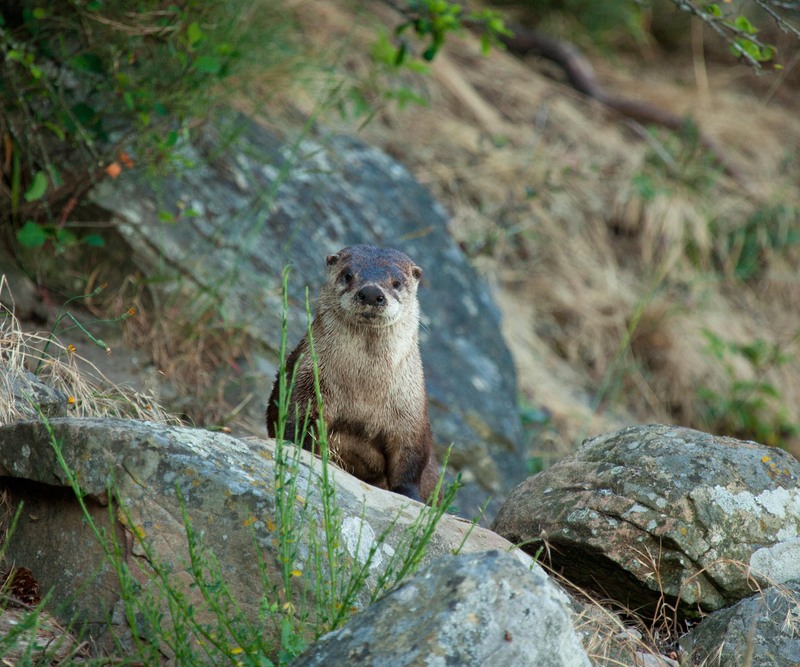 On all my previous encounters with these adorable creatures in the wild, there has been only one otter. 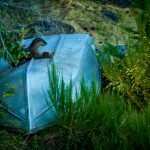 Yesterday, for example, when I was out kayaking, a lone otter emerged from the water, looking out and away from me, just a kayak length away. My heart was beating at this rare encounter with wildlife. Suddenly it turned round and saw me, and with an almighty splash, and a look of terror, disappeared. I felt very guilty for intruding. But these guys in front of me now are different. They have no idea they are being watched. The vantage point of this deck is great and I rush for my camera. Fumbling with a long lens as fast as I can, I feel a rush of adrenaline. Im very excited. The family of otters is now in plain view. A couple of them are sitting on a small upturned boat eating. I decide to try and get closer. There is a narrow steep pathway behind the boat shed that leads to the rocky sandstone beach below the cabin. Im creeping down, trying not to let my feet slip on the lose dirt. I make a twig crack. I hold my breath. The otter family cant be more than fifty yards away. I try to steady my breathing, but I cant. I can feel my heart beating in my throat! I emerge from the path onto the sandstone rocks. The otters are now only fifty feet away and slightly above me, on the bank to my left. This is close enough. I dont want to scare them. I remember my guilt of yesterday, scaring the poor little thing near my kayak. I try to hold my camera still. The evening light is failing me. Through the lens I notice that the boss of this group, Valdes, Im calling him, has noticed me. Not scared at all, he runs a little closer. I try not to swallow my tongue. Valdes makes a very unpleasant noise, somewhere between a bark and a snort. From my very core I know that he is ticked off that Ive managed to get a good photo of him. He motions to the others and they all turn to look at me. To my surprise I realise there are seven of them, and Im sure one of the otters is the little guy that I scared yesterday. Only now hes with his gang. The entire posse start towards me and I stumble backwards. Could seven otters overpower me and drag me to the mirky depths? Im not about to find out. I saw the way they tore their food apart. The otter gang change direction and head for the water. These guys are not intimidated by me at all. They enter the water, a mere thirty feet from me, and start to swim closer. They can close the gap between us faster this way. This is not good. Im retreating as fast as I can. My heart is pounding – Valdes and his crew have the advantage. I scramble on the loose rocks and look over my shoulder. I see them all holding up about five feet from the waters edge and now about forty feet from me. I feel a little safer and fire off a few more shots. I hear that noise again and make a hasty retreat up the bank. 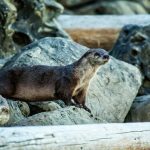 As I leave the otter gang, I take one last look back. The last rays of sun are hitting the water at a very low angle. A shaft of light catches Valdes – hes wearing a bandana. 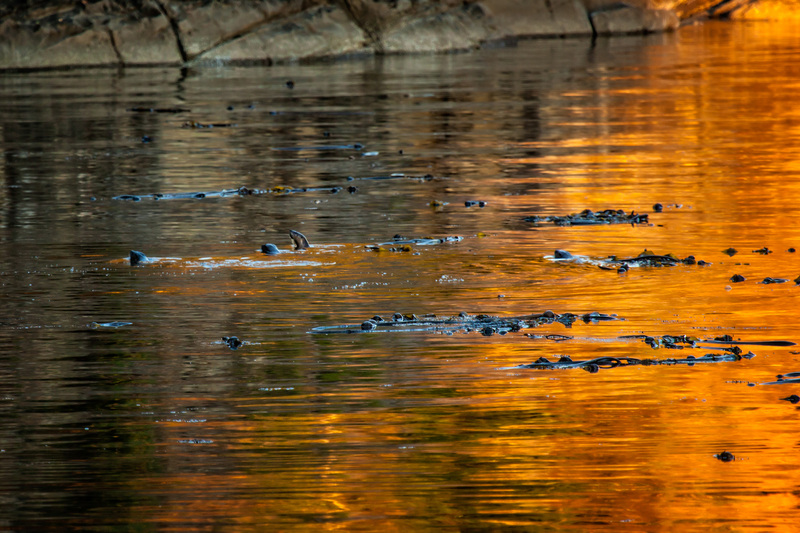 I see my little guy from yesterday, slightly apart from the other otters, illuminated in the orange glow of sunset. Hes not making the threatening sound of the other otters – hes laughing at me.